You may have observed that sometimes sealed bottles with metallic lids are so tightly screwed that one has to put the lid in hot water for sometime to open the lid. This would allow the metallic cover to expand, thereby loosening it to unscrew easily. In case of liquids, you may have observed that mercury in a thermometer rises, when the thermometer is put in a slightly warm water. If we take out the thermometer from the warm water the level of mercury falls again. Similarly, in the case of gases, a balloon partially inflated in a cool room may expand to full size when placed in warm water. On the other hand, a fully inflated balloon when immersed in cold water would start shrinking due to contraction of the air inside. It is our common experience that most substances expand on heating and contract on cooling. A change in the temperature of a body causes change in its dimensions. 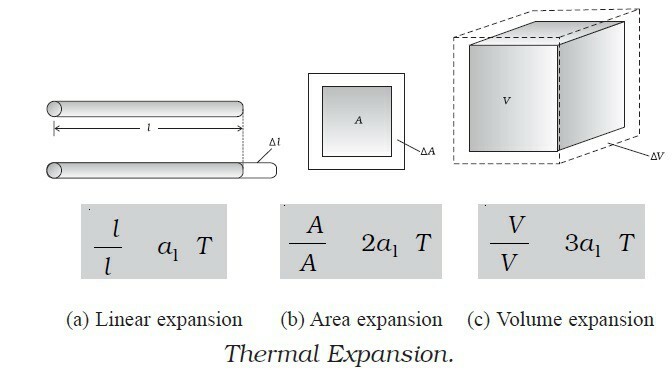 The increase in the dimensions of a body due to the increase in its temperature is called thermal expansion. When a material is heated or cooled, it changes its dimensions. Generally, it expands when heated and contracts when cooled although there can be exceptions to this rule. The expansion in length is called linear expansion. The expansion in area is called area expansion. If the substance is in the form of a long rod, then for small change in temperature, ΔT, the fractional change in length, Δl/l, is directly proportional to ΔT. where α1 is known as the coefficient of linear expansion and is characteristic of the material of the rod. Water exhibits an anomalous behavour; it contracts on heating between 0 °C and 4 °C. The volume of a given amount of water decreases as it is cooled from room temperature, until its temperature reaches 4 °C, [Fig. ]. Below 4 °C, the volume increases, and therefore the density decreases [Fig. ]. bottom up, which would destroy much of their animal and plant life. When rails are laid down on the ground, space is left between the end of two rails. The transmission cables are not tightly fixed to the poles. The iron rim to be put on a cart wheel is always of slightly smaller diameter than that of wheel. A glass stopper jammed in the neck of a glass bottle can be taken out by warming the neck of the bottles. The Eiffel Tower can extend by as much as 12 centimetres if the temperature increases by 40 ºC. So if you go to Paris in the summer and stand on top of the Eiffel Tower, you will get a little more height for your money than if you had gone in winter. When you first turn on a hot water tap, the water rushes out but is still cold. When it starts to become hot, the flow of water starts to become less and in some cases it stops. This can be explained as follows: the hot water heats the metal valve inside the tap which expands to block off any more flow of water. If water is gradually cooled, it shrinks in size as expected. But at 3.98 ºC it begins to expand again until it turns to ice at 0 ºC. This expansion is peculiar to water and is associated with the unusual shape of the water molecule. This behaviour explains why lakes freeze from the top downwards in winter. The colder water is at the top of the lake because it expands and becomes less dense. So when this water freezes it insulates the water below it from the outside cold air like a blanket. It is because of this property many fish can survive the winter rather than becoming part of a giant Popsicle.